← Women’s World Cup Final: Quote, unquote. World Cup 2014: Men’s Bronze Medal Match: England 0-2 Argentina. 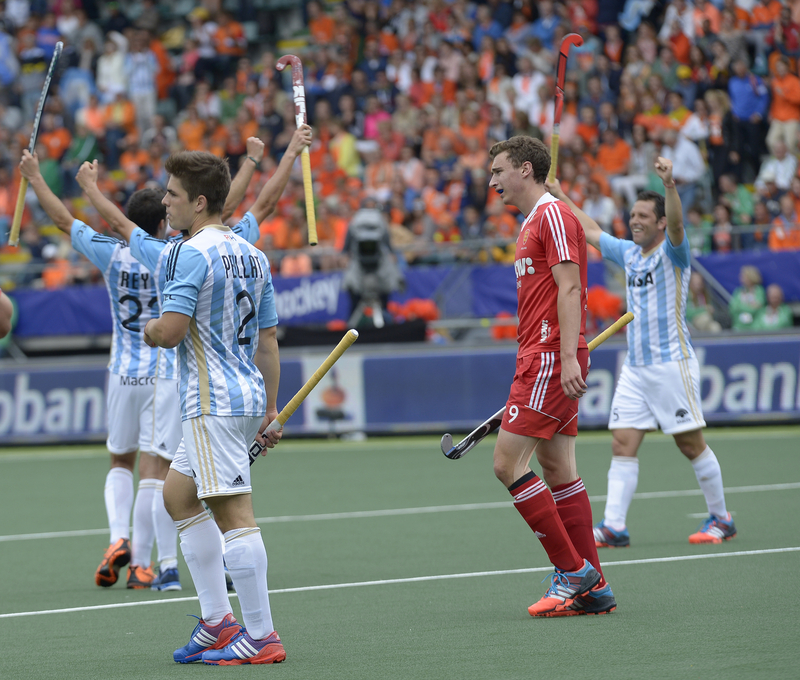 A brace from Matias Paredes sunk England and captured the bronze medal for Carlos Retegui’s Argentina side. In the game none of the semi-finalists wanted to play in, Los Leones’ No10 struck twice in quick succession to get his side in front and that is where they stayed. It was a cagey first half with England content to sit deep and allow Argentina to have the ball for long periods in an attempt to negate their fast counterattacking style, whilst Argentina seemed happy keeping possession and waiting for an opening. Both sides were turning the ball over regularly meaning it was a scrappy first quarter of an hour. England’s best chance of the early exchanges fell to Harry Martin. The No9 did well to get round the back on the baseline but with few options of a pass he was forced to try and smuggle the ball past the goalkeeper who smothered well at the near post. Argentina hit back and Juan Martin Lopez’s diagonal ball found its way through to Guidos Barreiros who was forced wide by George Pinner and could only find the side netting. With five minutes until the break Argentina forced a penalty corner. With Gonzalo Pelliat in red hot form it looked odds on they would take the lead but Pinner made a stunning save, diving to his left and getting a strong hand on the ball to keep it out. On the stroke of half time England forced a penalty corner of their own but Ashley Jackson’s flick was charged down by the runner and the sides remained locked at 0-0 at the break. England forced a penalty corner six minutes after the break. Mark Gleghorne went for goal but his effort was well saved by Juan Manuel Vivaldi. The goalkeeper was then called upon to clear from Ashley Jackson’s close range effort. The game started to open up as the teams hunted for the opening goal Agustin Mazzilli displayed some wonderful 3D skills on the left touchline to get away from his marker and from a narrow angle he stung Pinner’s pads. Dan Fox did well to charge down a Pelliat penalty corner and the opening goal was starting to look like it might never come. However, with 15 minutes left, it did. Lucas Vila’s cross from the left found Paredes all alone at the far post. He cut back across goal and despite a great effort from Pinner he found the net with a cool finish. A minute later it was 2-0 and the same combination. Vila got round the back on the right and crossed for Paredes to apply the finish. England hit back and Vivaldi made a stunning save from Barry Middleton’s deflection off a penalty corner and then he denied Jackson from another penalty corner with the clock ticking down. England could not find a way past and Carlos Retegui, the coach of both men’s and ladies’ teams celebrated his second bronze medal of the tournament. 1 Response to World Cup 2014: Men’s Bronze Medal Match: England 0-2 Argentina. I did a small cry at this one.